Andrew Orlando Valmon was born January 1, 1965 in Brooklyn and grew up in Manchester Township. A graceful and explosive athlete, he developed into a top prep sprinter at Manchester High School under coach Bob Conover. With Andrew leading the way, the Hawks won 46 meets in a row. More important, they were undefeated against arch-rivals CBA and Asbury High School in the ultracompetitive Shore Conference. Andrew stayed in-state for college, accepting a track scholarship from Seton Hall. He found his comfort zone in the 400 meters and, by his sophomore year, was one if the country’s top runners in that event. Andrew graduated in 1987 with a communications degree and was a three-time All-American. Among the many records he set was the Big East Championship record in the 400 as a senior, which remains unbroken. 1n 1988, Andrew entered the Olympic Trials and finished 6th in the 400 meters. He was added to Team USA for the Summer Games in Seoul and ran in the first three races. He was replaced by Kevin Robinzine in the final, which the Americans won in record-tying time, earning Andrew a gold medal. The record they tied was set in 1968 with the help of another New Jersey runner, Ron Freeman of Elizabeth. In the years that followed, Andrew continued to place among the world’s elite sprinters at 400 meters. At the 1991 World Championships, he was a member of the silver medal-winning 4 x 400 relay squad. Unlike other sprinters in the US and around the world, running was not Andrew’s job. He worked as a salesman. He took a leave of absence in 1992 to train with Guy Kocjel, the former Arkansas State coach. 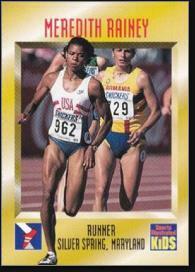 Andrew finished 4th in the 400 meters at the 1992 Olympic Trials to secure a spot on the relay team for Barcelona. The Americans won gold again, as Andrew joined Quincy Watts, Steve Lewis and Michael Johnson on the podium. In 1993, Andrew and his 4 x 100 teammates set a world record with a time of 2:54.29 at the World Outdoor Championships. As he approached age 30, Andrew started thinking about the next phase of his career. He moved to Washington in 1995 after accepting an assistant coaching job at Georgetown and eventually to Maryland in 2003 after being hired to coach Terrapin track team. He married 800 meters specialist Meredith Rainey (left) in 1996. Andrew coached Team USA at the 2010 world indoors and in 2011 was picked to coach Team USA’s track squad at the 2012 London Olympics. USATF wanted to shake things up after a disappointing performance in China in 2008. Americans won gold in the 110 meter hurdles and decathlon, silver in the 1500 and 10,000 meters, 110 and 400 meter hurdles, and 4 x 100 and 4 x 400 relays. In 2015, the 4 x 100 squad was stripped of its silver medal after Tyson Gay was caught doping. 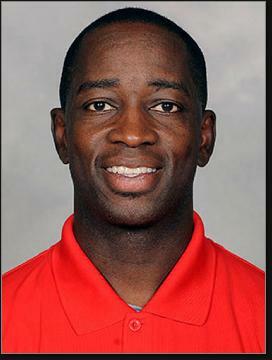 Andrew continues to coach the Maryland track and field program. Two of his runners—Micah Powell and Thea Lafond—competed in the 2016 Olympics. Thea was named Big 10 Field Athlete of the Year.